Despite challenging market conditions, the global nuclear industry delivered a strong operating performance and improvements in construction times of new reactors in 2015, according to a new report from the World Nuclear Association. The report says that if the world is to meet its climate change targets then the rate of new build will need to accelerate. In its first annual World Nuclear Performance Report, published yesterday, the association provides key metrics on nuclear power plant performance and reviews recent developments in the global nuclear industry. The report says ten new reactors, with a combined generating capacity of 9875 MWe, were brought online last year, while seven reactors representing 3934 MWe of capacity were permanently shut down. A total of 439 reactors were in operation at the end of 2015. Nuclear power plants generated 2441 TWh of electricity last year, accounting for some 10% of total world generation. "Nuclear power plants were again among the world's best performing generating stations in 2015. The global fleet regularly performs to its highest technical capability," the Association said. It noted that the average capacity factor of the world's reactors (excluding those in Japan, which have largely remained idle) was 81.7% in 2015. It has been over 80% since the start of this century. The report said reactors are operating longer than they had originally been licensed to, "with 60 years becoming the norm". It notes there is "no significant age-related trend in nuclear reactor performance", with older plants operating as well as younger plants. 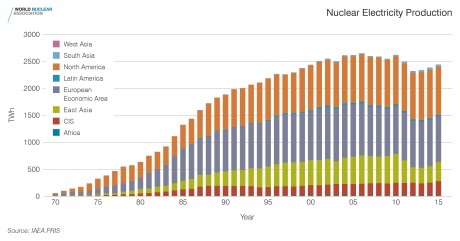 In addition, nuclear units are continuing to be uprated to increase their generating capacities. "The years since 2011 have been some of the most challenging for the global nuclear power plant fleet," the Association said. "Despite this, industry prospects seem brighter than they have been for a while, with the Japanese restarts, a range of new technologies (especially small modular reactors) advancing in development, several major nuclear build programs about to get underway, and a positive shift in public support for nuclear energy in many Western countries." However, it added, "There is still scope for improvement in the performance of the global reactor fleet through the improvement of day-to-day operations among mid-range performers that would allow them to match the best performers." The World Nuclear Association said, "Policy direction and market conditions will be crucial to operator decisions on long-term operation of existing reactors, and therefore the ability to sustain the current contribution of nuclear power." At the end of 2015, there were 66 power reactors under construction around the world - half of these in East Asia, particularly in mainland China - and another 158 planned. The World Nuclear Association noted that more reactors are under construction and more reactors came on line last year than at any time in the last 25 years. Four countries - China, India, Russia and South Korea - are expected to account for 70% of reactors commissioned up to 2030, it said. The construction period - from the pouring of first concrete to grid connection - has lengthened in several countries but shortened in others, the report noted. However, the previous tendency for construction times to lengthen has started to reverse, it said. The average construction period for new reactors starting up in 2015 was 73 months, compared with 127 months for 2014. "Nuclear energy is proven, scalable over the timeframe required, and helps to underpin sustainable development prospects," the Association said. "The use of nuclear energy is recognized widely as being crucial to achieving climate targets as well as the general energy policy goals of affordability and reliability." However, it warns that although new build levels are at a 25-year high, they are insufficient if the world is to meet the climate targets agreed at the COP21 meeting in Paris last year. "The rate of new grid connections will have to increase significantly to support global economic growth, alleviate energy poverty and provide enough clean energy to meet agreed climate change targets." The World Nuclear Association considers that, in order to meet the goals, there should be 1000 GWe of new nuclear build by 2050, with nuclear generation supplying 25% of global electricity demand. Agneta Rising, director general of the World Nuclear Association, said: "This report shows that, despite challenging market conditions in some regions, existing nuclear plant performance is strong and the pace of new build is accelerating."